Are they for real? A look at three of the nation's top psychics and the lawmen they worked with. Investigators close cases—that's their job. Some cases, however, drift on for years, creating a burden an investigator may have to shoulder for their entire career, or even for the rest of their life. Cases like these often cause a dilemma for the law enforcement community, leading them to try unusual methods of investigation. One of those methods is using psychic detectives, a popular topic on cable and mainstream TV. 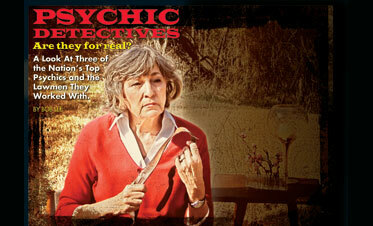 The interest in psychic detectives, though, isn't restricted to the general public. Their use by police agencies has been well documented for some time. The results, however, are open to endless debate. In this article, sample cases from three of the nation's top psychics, along with the officials they worked with, are profiled. The psychics were selected based on their depth of experience working with law enforcement. All of them are women who have appeared on numerous TV shows, and one even had had her own radio show. Renier didn't realize she was psychic until she was in her mid-30s, while working as a public relations and advertising director at a large hotel in Orlando, Fla. At the hotel, Renier attended a lecture given by a psychic, who helped her realize she was also sensitive to paranormal activity. From that day forward, Renier began a gradual transformation from skeptic to believer and to finally honing her own psychic gifts. In 1981, FBI Agent Robert K. Ressler, author of Whoever Fights Monsters , invited her to give a series of lectures at the FBI Academy. During one of those lectures, she predicted the attempted assassination of President Reagan several months before the shooting. Ressler speaks highly of Renier in his book, where he specifically references this prediction. Williston is a small town. Slaughter and Hewitt would often bump into Lewis's brother and his sister-in-law once or twice a week and they would always ask, "Anything new on Norman?" The officers would offer them words of hope, the same words they had given them the week before. To Hewitt and Slaughter, those words seemed trite and hollow. Both knew they weren't giving up, they just wished they had something new to tell the Lewis family. Hewitt met with Slaughter and the Lewis family when he returned to Williston. It was agreed that if the family paid Renier's consultation fee of $650, the Williston Police Department would follow up on any information she provided. Hewitt took a pair of shoes and a wallet owned by Lewis and drove back down to Orlando where he met Renier at her home. "On a missing person case," said Renier, "I don't want a photograph; I want a personal object like a shoe. A shoe has a lot of energy." 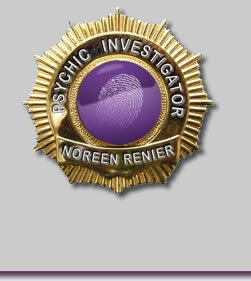 Renier uses personal items to get her impressions through psychometry—the ability to pick up information through inanimate objects, a technique often used by other psychics. Renier isn't sure how she does what she does; she can only describe what it feels like in her head. "I can often float in the air above where the person went missing," she said, "and see physical features that flash through my mind like the frames of an old movie film strip." As the images emerge, she describes them out loud for the detective, who can ask questions for clarification to help her hone in on what's relevant to the investigation. Renier slipped into a trance with Hewitt present, recording what she said on tape. "As I held Lewis's shoe," said Renier, "I began seeing a series of images flashing through my mind. I could see Lewis falling off of a cliff; encapsulated inside his truck and surrounded by vegetation; that a pile of bricks, a bridge and an old railroad bed were nearby. And then I saw a series of numbers. First came 45, which I knew was connected to a road, then 21 and later the number 22. But the last two sets of numbers had no meaning to me." Renier then drew a map on plain notebook paper, penciling in the location of Lewis' home, with a line leading away from it, in the direction Lewis could be found. Renier had never been to Williston before. "I will admit," said Slaughter, "that after a couple of months, I was about ready to call it quits. Even though we were a small department, with 16 full time officers, we had other cases to work. But Brian really believed that Renier's clues would bear out, so I told him, 'I'll stick with you.'" Several months passed, and Hewitt was still on the hunt for Norman Lewis. By now, though, Hewitt had zeroed in on an old phosphate pit with cliffs, a couple of miles from Lewis's home. He found a steel rail in a heavily wooded area near the pit, but no railroad bed. The pit was located in the general direction from Lewis's house that Renier's hand-drawn map had shown. "One day, Brian's roaming around up there in the woods," said Slaughter, "and he finds a pile of red bricks. He went back to the rail he discovered earlier, started digging and found an old railroad bed underneath it. I called Levy County Sheriff's Department divers to come over and work the pit. But they came up empty. The pit had water in it 30 to 40 feet deep and was covered in vegetation. "So I'm up there at the pit with Brian after this, wondering where we go next, and I happen to look just right through the woods and see an old Fairbanks Morris Scale. It was a wooden truck scale that could be confused for a bridge." Slaughter's confidence grew, and he got some Navy demolition divers to dive the pit on their off time. On their second day, they got a hit while using a magnetometer. "By that afternoon Norman's truck was winched out of the pit," said Slaughter, "and there was Norman, inside the cab, mummified from the limestone and encrusted." Several different roads led into the pit. "On one road," said Slaughter, "You would come up over a rise, and the road turned right. If you were on the next level up, the road comes over a rise and it just goes off a shear drop. We're not sure how or why Norman ended up in the pit. But I think he probably got confused." "Now Hewitt and I start working on the numbers. We have to complete the puzzle. Lewis's home was exactly 2.1 miles from the pit. The entrance to the mine is located on US 41, but if you look at the map carefully, you'll see it's also SR 45. Now we were left with the number 22 and couldn't do anything with it. That was until we had Norman's watch cleaned up before giving it back to his brother. It had stopped on the 22nd of the month." He added, "I can only tell you what the facts are that led us to Norman. 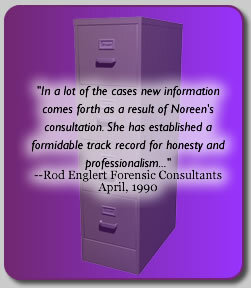 And I can also tell you that we wouldn't have found Norman Lewis without the help of Noreen." Weber became a nurse at 19. By the age of 27, she was working in an experimental acute psychiatric unit in the South Bronx of New York. "I loved it," said Weber, "I was psychically attuned to ferreting out the root cause of people who exhibited major psychosis. I could take a catatonic locked away for decades and in 35 minutes, I'd have him chatting with me." What Weber didn't like was the internal politics at the institution. She decided to strike out on her own as a psychic, and she never looked back. "We had a couple of guys we were looking at," said Heater, "and one of them was John Reese, 31, a farm worker, who lived on the upstairs floor above Cornish's apartment. We put him through a polygraph, and he passed. My partner thought he was still good for it, but I thought it might have been Cornish's boyfriend." It was at about this time that Cornish's sister requested that a psychic get involved with the case. "When I found out it was Nancy Weber," said Heater, "I was comfortable with that because we had worked together in the past. In fact, I had an experience with another psychic in the '70's. She was so accurate it was scary. In that case, she picked the barrel out of 150 others that contained the murder victim. So I knew in some cases they could help." Heater brought Weber to the crime scene during daytime hours, when he knew Reese was away working. Weber wasn't told before hand that Reese was a suspect. "As soon as she walked into the apartment," said Heater, "she insisted that the evil was upstairs, and whatever happened had come from upstairs. She later described a man with a scar on his face that wore a large belt buckle [western style] and had the initials J.R. When I told her that this man [with the initials J.R.] had passed a polygraph, she said, 'Go talk to him again.' My partner went back to talk to Reese again, and he did indeed have a scar on his face and a big belt buckle. "As we searched the woods, it was interesting to me that we did come up on a swampy area. If I were Reese, that's where I would have thrown the hammer. In some places, there was six feet of water and it was crawling with water moccasins. If he had thrown the hammer in there, it would have been very difficult to find. "Nancy's information is very accurate; it's just that it's so scattered you have to make sense of it. It's all a puzzle, and you have to put it together." Annette Martin has known since she was seven that she possessed abilities other children didn't. It started one day when she had a premonition of being hurt by a group of playmates, and 10 minutes later they turned on her. In 2006, Martin testified in a murder trial where the defendant was a psychic. "I am the first psychic ever declared as an expert witness," says Martin. "The defendant's attorneys wanted me to prove that psychic detectives do exist." Two and a half months later, Prado was still missing, and his family contacted then-Sgt. Fernando Realyvasquez of the Pacifica Police Department. They had heard of Annette Martin and wanted to see if she could help. "As you can imagine," said Realyvasquez, "I rolled my eyes like most people would. But I ran the request by my chief who said, 'It won't hurt to try it if it will make the family feel better.'" Realyvasquez met with Martin at her office. Martin never went to the park or visited Prado's apartment. "Sgt. Realyvasquez brought me an armload of maps," Martin said, "including a topographic map of the park and a picture of Prado. I took three deep breaths and went into a trance, while holding his photo. I became Prado and could see the trail he had taken as he walked away from the apartment complex and into the park. I could see where he had fallen down and died of a heart attack. I ran my right hand over the topographic map and felt a warm spot coming off of the map. I circled that spot and told Sgt. Realyvasquez that is where Prado would be found. I also drew a rough map on legal notebook paper, of where Prado's body would be found in some bushes, just off of a trail leading away from his apartment and into the park. I wrote the date July 15, 1997, at the top of this map." "The size of the circle she had drawn on the topographic map," said Realyvasquez, "was a quarter of an inch, which on this map equaled about an eighth of a mile across. After this, I got together with a couple of other officers and went to look for him, but didn't find anything." A couple of days later, Roberta Houser, a search and rescue volunteer came to Realyvasquez's office. On the morning of July 19, 1997, Houser and another search and rescue worker, together with a cadaver dog, entered the park at 8 a.m. By 9:15 a.m., they found Prado's decomposed body 15 feet off of a trail in some brush, inside the area Martin had circled on the topographic map. "I'm just as skeptical as I was before," said Realyvasquez, "but the only reason we found Prado was because of the information Martin provided." Dave Heater, who retired as chief of detectives, sums it up this way: "I look at psychics as tools, the same as I would a polygraph examiner. Psychics can only provide pieces of the puzzle. It's still up to the detective to put all of those pieces together." Bob Lee recently retired as a lieutenant with the Florida Fish and Wildlife Conservation Commission after 30 years. He has previously written articles for law enforcement and outdoor magazines. E-mail: bl_gamewarden@hotmail.com . Copyright © Elsevier Inc., a division of Reed Elsevier Inc.